Horror sequels almost never get it right. That’s a basic truism in horror filmmaking: Sequels tend to ramp up the action, or devolve into camp, or throw in a bunch of filler, or replace memorable characters with cookie-cutter copies, or any of a number of other sins. The definitive counter-argument, though, is one feature: Aliens. James Cameron’s 1986 sequel to Ridley Scott’s 1979 horror classic Alien makes no pretenses of trying to re-create the original film; it’s unabashedly action instead of horror, and it’s completely unembarrassed about doing everything bigger and bolder, including scaling up from alien drones to an alien queen. But Cameron grasped what so many horror-sequel directors miss, and his script focuses on people as much as monsters. 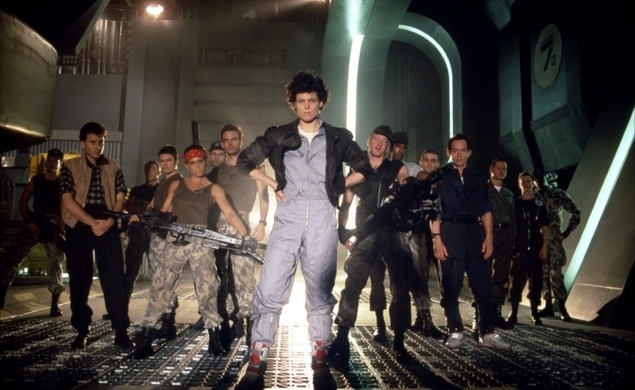 It introduces characters that are more memorable and better-defined than Alien’s crew. It doesn’t get bogged down in complicating or explaining Alien’s perfectly servicable unknowns. It ups the special-effects ante without demystifying its creepy aliens. And it finds its strongest element in the idea that Alien’s emergent protagonist, Ellen Ripley (Sigourney Weaver), is forced against her will to re-encounter the scariest thing she’s ever dealt with—and that she then evolves and finds the courage to take it on willingly. Still one of cinema’s pre-eminent badasses nearly 30 years later, Ripley became iconic in this movie. There’s plenty to talk about in her past, her future, and her particular version of mama-bear heroism. We hope you’ll join us next week as we dig into Cameron’s career, Ripley’s evolution, and the indelible, memorable, genre-defining support cast of Aliens. Game’s not over yet, man.